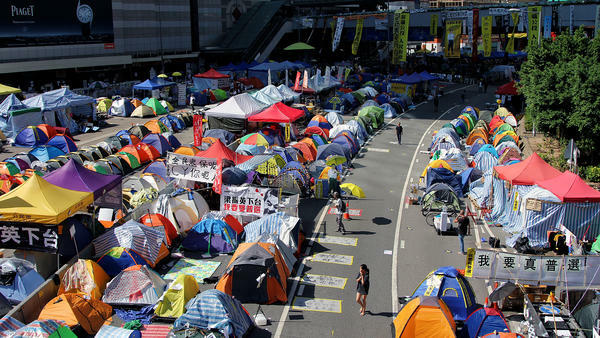 A census by protesters estimates the main protest camp in Hong Kong is home to about 2,200 tents, but most are empty these days as crowds have dwindled. Jimmy Lai, a billionaire media mogul, is a fixture at the protest camp. He says demonstrators need to retreat so they don't lose the goodwill of Hong Kong people. Hong Kong's pro-democracy protests, the longest of their kind on Chinese soil since the 1989 Tiananmen Square uprising, turn 2 months old on Sunday. In early October, the demonstrations grabbed media attention around the world and galvanized Hong Kongers, but now most of them just want the protests to end. Independent polls show people overwhelmingly oppose the continued occupation of city streets because it's inconvenient and appears to be futile. "I think they should leave, because it's been two months," says Wisdom Cheng after picking up his associate's degree last week at a graduation ceremony at City University of Hong Kong. "The government still didn't reply," adds Cheng, who participated in the protests in October. "So, I think it's useless still staying in the protest area." Across the harbor in the main protest camp, demonstrators gather at night to debate the movement's future. Since early October, the camp has gradually grown to include more than 2,000 tents, according to a census by demonstrators. But the huge early crowds have dwindled and most of the tents are empty. The protests have lasted far longer than anyone imagined, and there is a sense of the passage of time. In early October, the weather in Hong Kong was still warm and protesters wore shorts. Now, with December approaching, demonstrators mill about in jackets. In the distance, a giant neon Santa Claus covers the side of a building. "A lot of the people here are very tired," says 26-year-old Jessie Ho, who works for a nearby nonprofit and comes to the camp every night after work. "But they have formed a community, and they believe that they should either stay here together or leave together, and there is no way you can get most people to leave." That's because it's hard for protesters to walk away empty-handed. China's Communist Party in Beijing has refused to make any concessions to the protesters' key demand that people be allowed to nominate candidates for the next election of the city's chief executive in 2017. Another reason people won't leave en masse is they just can't agree. Forging a consensus in a spontaneous political movement like this is tough. "The vast majority of the protesters came on their own, and, therefore, they believe that they should decide by themselves when to go," says Joseph Cheng, a professor of political science at City University of Hong Kong and a democratic activist. "There is, of course, the beauty of spontaneity, but it also means that there is lack of leadership." Simply put, no one is in charge. Many democratic leaders want to build an organization that can press the movement's cause long after the tents have been swept away. "We have to move from the protest site to the community," said Lee Cheuk-Yan, a pro-democracy lawmaker, "because we need to gain public support." Most of the demonstrators these days are students or people in their 20s. There is a man in his mid-60s, though, who sits in a camping chair reading a book most days. 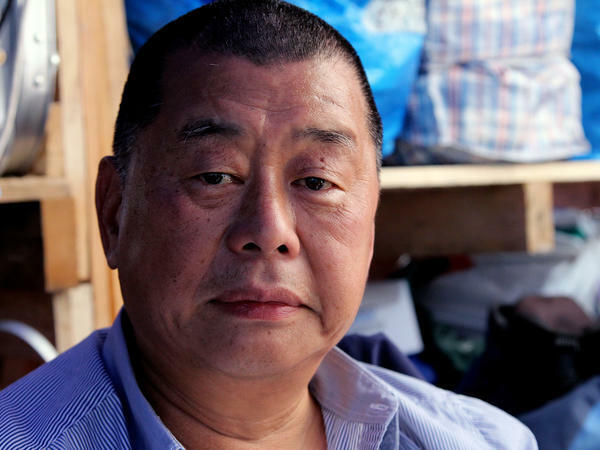 He's Jimmy Lai, a billionaire media mogul and a key backer of the democracy movement. Lai owns Apple Daily, a leading pro-democracy newspaper, and Next Media, which mocks China's Communist Party in animated shorts. One morning last week, Lai was reading The Autobiography of Martin Luther King Jr., a gift from a fellow demonstrator. Lai says demonstrators need to retreat and stop irritating people by blocking roads. He also thinks that, no matter how they end, the protests have changed Hong Kong, making the city more political and more polarized. An attack he experienced last week seemed to hammer home that point. Several men rushed up, threw rotting animal guts on Lai and cursed him. "Very horrible," he says of the odor. "Even after a few days, I still smelled it." Hong Kongers have long been seen as pragmatic money-makers, but Lai says the past two months have proved otherwise, with young people showing more dedication to democracy than many expected. "Even Hong Kong people like myself have rediscovered Hong Kong," Lai says. "The young people have given us hope; the young people have given us a new sense of dignity, a new sense of pride." This is WEEKEND EDITION from NPR News. I'm Rachel Martin. Hong Kong's pro-democracy protests are now into their third month, making them the longest lasting of their kind on Chinese soil since the 1989 Tiananmen uprising. But polls show most Hong Kong residents are fed up with the blocked streets and general inconvenience caused by the protests. What's more, many residents see them as a futile exercise that won't bring real change. NPR's Frank Langfitt has the story on where China's pro-democracy movement goes from here. FRANK LANGFITT, BYLINE: It's graduation day at City University of Hong Kong - cause for all sorts of celebration. On his black graduation gown, Wisdom Cheng wears a yellow ribbon, a symbol of the pro-democracy movement. But even Cheng, who's participated in the protest, says it's time to wrap them up. WISDOM CHENG: I think they should leave because it's been two months. The government still didn't reply. So I think it's useless keep staying in the protest area. LANGFITT: Across the harbor in the main protest camp, dozens of demonstrators are sitting on the steps of a subway stop at midnight listening to a guitarist and pondering what to do next. JESSIE HO: A lot of people here are very tired. LANGFITT: Jessie Ho is 26 and works for a nonprofit. She comes to the camp every night after work. HO: But they have formed a community, and they believe that they should either stay here together or leave together. And there's no way you can get most people to leave. LANGFITT: In part, because it's hard to walk away empty-handed. China's Communist Party in Beijing has refused to make any concessions to the protester's demands for open elections. Some demonstrators want to shift from peaceful nonviolence to more radical tactics, such as disrupting the work of the government. But Ho says forging consensus in a spontaneous political movement is tough. HO: Everyone believes in democracy here are, obviously. And when people are so hard-core about this, they don't want to listen to anyone telling them what they should be doing. It's just a whole crazy brainstorming session here for weeks now. LANGFITT: Is anyone in charge? HO: To be honest, nobody is in charge right now. JIMMY LAI: We should consider the whole movement in different phases and end this first phase by retreating. LANGFITT: Jimmy Lai also comes to the protest zone each day. This morning, he's sitting in a camping chair reading "The Autobiography Of Martin Luther King Jr." Lai and others say the next phase should include protesters going out into the community and winning more support, not continuing to irritate people by blocking roads. LAI: If we exhaust the goodwill of the people, we will find it more difficult to come back to protest. LANGFITT: Lai isn't your typical demonstrator. He's a 65-year-old billionaire media mogul. Lai owns Hong Kong's pro-democracy newspaper, Apple Daily and Next Media which mocks China's communist party in animated shorts. He says no matter how they end, the protests have changed Hong Kong, making the city more political and more polarized. An attack he experienced last week would seem to prove that. Several men came at Lai, cursing, armed with rotting animal guts. LAI: In the spirit of the moment, they just threw the entrails onto my body. LANGFITT: What did it smell like? LAI: Very horrible, you know, very horrible. Even after a few days I still smelled it. LANGFITT: The other big change in Hong Kong - people here have long been seen as pragmatic moneymakers. But the young generation appears more dedicated to democracy than many realize. Again, Jimmy Lai. LAI: Even Hong Kong people like myself has rediscovered Hong Kong. You know, the young people has given us hope. The young people has given us a new sense of dignity, a new sense of pride. LANGFITT: Now they just have to figure out how to leave the streets and move forward. Frank Langfitt, NPR News. Transcript provided by NPR, Copyright NPR.